At Quast our strapline is “Making Quality a Habit”, it summarises our approach as we provide Quality Assurance and Software Testing services to our customers. When we were thinking about how to exemplify this aim to potential customers one man came to mind as a perfect living manifestation of the concept. This Talk article looks at how Dougie MacLean is Making Quality a Habit and how you can come and see him do it live. The origins of our strapline, Making Quality a Habit, come from an Aristotle quote where he said “Quality is Not an Act, it is a Habit”. The quote asserts that quality doesn’t come about by one-off actions; it is about repeated performance and making tweaks and adjustments until you have perfected it, until it becomes habitual. The quote speaks to longevity, repetition and mastery. At Quast we provide specialists in QA and Software Testing to work with companies. When in place at a company our specialists work to ensure that a clearly defined, repeatable and continually improving quality assurance process is performed on all changes to software. As part of this process we test that the changes meet the original business requirements. And all of this is done with the ultimate aim of assuring that the quality of the changes is such that they will delight the company’s customers. As a company we aim to establish Quast as a byword for Making Quality a Habit. However, as a young company, there are many companies we have yet to work with. So as part of our introduction to those companies we wanted to find a way of explaining why this aim is so important to us and illustrating what it looks and feels like when you are devoted to Making Quality a Habit. We thought a perfect way to do that was by looking at someone who is an embodiment of this ideal and looking at how this is demonstrated in their behaviours and visible in the results. So what would that person look like? They would have spent a long time doing what they do, continually practicing and improving their performance. Their dedication would lead you to consider their role beyond an occupation, more a calling. Their work would be admired: it would be ‘covered’ or replicated by others; and, they would receive awards or recognition. Dougie MacLean came to mind as fulfilling all of these things and more. 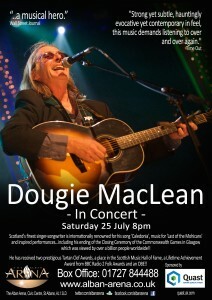 To borrow the summary of SingOut USA “Dougie MacLean is Scotland’s pre-eminent singer-songwriter and a national musical treasure”. He recently celebrated having spent over 40 years in music. His continually evolving and expert performance has led to concerts and festivals all over the world including New York’s Carnegie Hall, Glasgow’s Royal Concert Hall and London’s Festival Theatre. His ending of the Closing Ceremony of the Commonwealth Games in Glasgow (with Kylie Minogue and Lulu) was viewed by over a billion people worldwide! As an illustration of the admiration for his music among his peers, his song have been covered by Paolo Nutini, Amy MacDonald, Ronan Keating, Mary Black, Frankie Miller, Cara Dillon and Kathy Mattea among others. Recognition in the form of awards have included him being awarded an OBE in 2011 and BBC2 Folk Award for Lifetime Achievement for Contribution to Songwriting in 2013. While all these things mark Dougie out as an exemplification of someone Making Quality a Habit, the best illustration comes in seeing him perform. To pick a single performance as an example, take a look at this performance of Green Grow the Rashes: https://www.youtube.com/watch?v=0eplPt9bq1g Dougie is so at home on the stage it comes across as his natural habit and his audience are so engaged they become part of the show. And this isn’t even Dougie’s own song, but his interpretation of a Robert Burns work. The parallels don’t end there. While Making Quality a Habit summarises our aim at Quast, our Manifesto – displayed at Quast.uk.com – identifies other behaviours and mindsets we believe important to achieving this aim. Here too Dougie exemplifies our thinking. In ‘Practice What You Preach’ we discuss our belief around maximising the use of technology. With butterstone.tv Dougie and his family have created a High Definition broadcast service to provide a mechanism directly connect his global fanbase and his live performances without relying on media scheduling or individual venues. In ‘People are the Key’ we talk about the importance of your interactions with others. Dougie’s focus on community can be seen in his successful Perthshire Amber Festival where he draws together performers he admires; in the involvement of his wife, son and daughter in his support team; and, in his OBE which was awarded for contribution to music and charity. Finally, in Win-Win we talk about mutual benefit and again here the Perthshire Amber Festival is a good example. With the festival Dougie brings visitors and income to the local community he enjoys and benefits from. With all this in mind we thought it would be wonderful to see Dougie perform in St Albans, Quast’s home town. We’re delighted to be helping do just that as sponsors of Dougie MacLean in Concert at the Alban Arena on the 25th of July. Follow the link below for tickets. We hope you will join us to see Dougie demonstrating Making Quality a Habit!